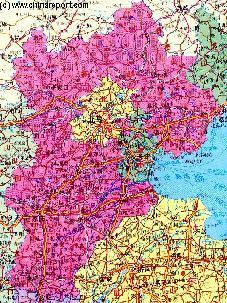 The Tianjin City Province Maps Index gives acces to all Maps relevant to Tianjin City Province and Area's of Specific Interest within that Province, as used and/or produced by ChinaReport.com. Please use these Maps to find your way easily around the Province, Cities, Area's and many Monuments & Landmarks. An obviously non-Chinese but western-made Map of the Qing Dynasty Manchu Empire in the year 1910 AD, a year in which its sovereignty has been under threat and siege for over 70 years. 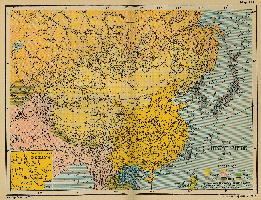 In this Map of 1910 AD, made one year before the abdication of Last Qing Emperor Xuan Tung (a.k.a.Aisin-Gioro Pu Yi) and the final end of China's Feudal History, China is depicted as in its smallest boundaries and definition. 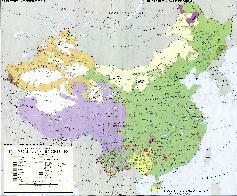 Most notably the North-East (Manchuria), and Inner Mongolia, both territories nominally under Manchu Control and under Manchu Sovereignty are depicted as separate area's. Other interesting features of the Map and geography of the Time : after the Sino-Japanese war of 1899 AD, both Korea and the Island of Formosa (now Taiwan / ROC) have been annexed by the Japanese Empire and Port Arthur (Dalian) is now a Treaty Port and a leased Base for the Russian Pacific Fleet. A schematic overview of North-East China's Hebei Province entire, delineating Provincial Borders and parts of neighboring Shanxi-, LiaoNing- and Shandong Provinces and Inner Mongolia Autonomous Region. Includes Cities and Towns (shown by size), Main Monuments & landmarks, Main Mountains (with Height), major highways, railroads, waterways, and Airports (National & International) and links to furher information on Cities, Monuments and main transportation hubs of the wider Region. 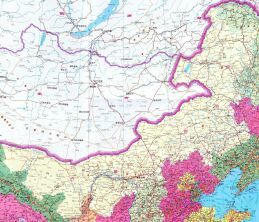 A Geographic Map overview of North-East China's Hebei Province entire, delineating Provincial Borders and parts of neighboring Shanxi-, LiaoNing- and Shandong Provinces and Inner Mongolia Autonomous Region. Map includes Great Wall of China Locations in Hebei Province, Main Cities and Towns (shown by size), Hebei Province Monuments, Main Mountains (with Height), major highways, railroads, waterways, and Airports (National & International) and links to furher information on Cities, Monuments and main transportation hubs of the wider Region. A Full Google Earth Supported Map of Tianjin City Province by Google.com. 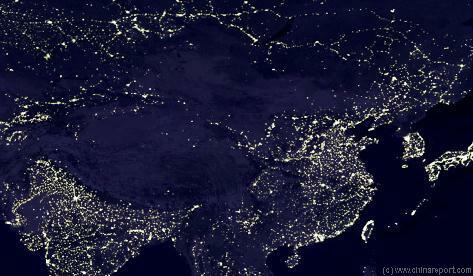 The China Report introduced on Levels of its Online Publishing's in April of 2009, including Hebei Province. 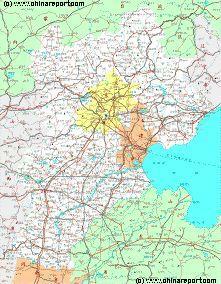 Adjacent Map gives direct access to Tianjin City Province Map by Google Earth. See North China with Beijing and Tianjin Cities, Hebei Province, Shanxi Province, Inner Mongolia Autonomous Region, Ningxia Autonomous Region and the Republic of Mongolia at a glance and navigate the various chinese provinces and regions, capital cities of Mongolian Aimag (Provinces), rivers, lakes, landmarks and locations. CLICK MAP AND LOCATIONS TO GO TO FULL IMAGE AND AVAILABLE INFORMATION !! 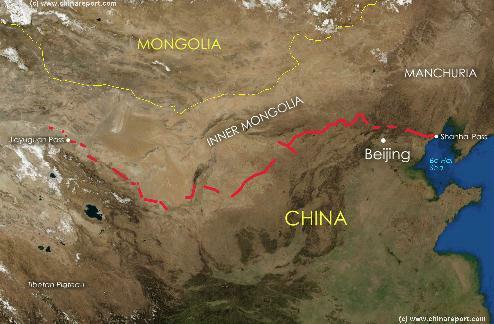 A Schematic Map overview of North & North-Eastern China's Inner Mongolia Autonomous Region entire, clearly delineating borders and including sections of all bordering Nations as well as bordering Chinese Provinces and Autonomous Regions of China. 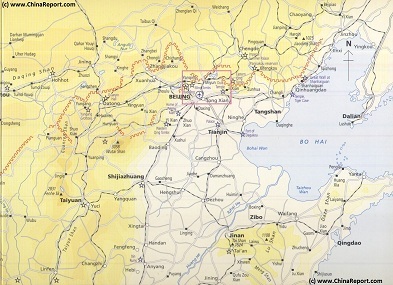 Map and description include Main Cities and Towns, Main Monuments & Landmarks of Inner Mongolia AR and adjacent provinces & regions, the locations of the Great Wall of China inside the Map Area, major highways and road connections, provincial railroads and main railroad-stations, and main waterways, rivers and lakes of Inner Mongolia AR and wider region. 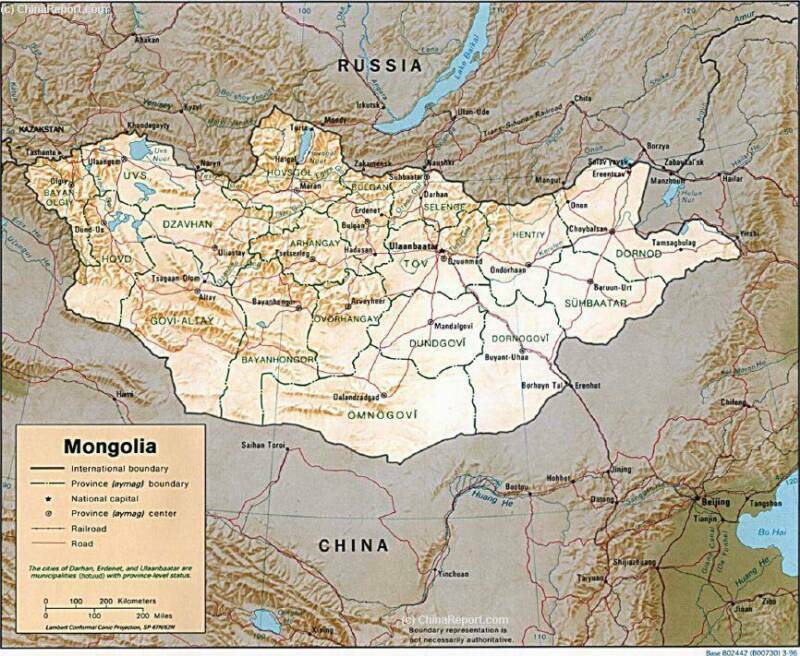 This Map further provides links to on site photos and information on Cities, Main Monuments & Sights of Inner Mongolia.